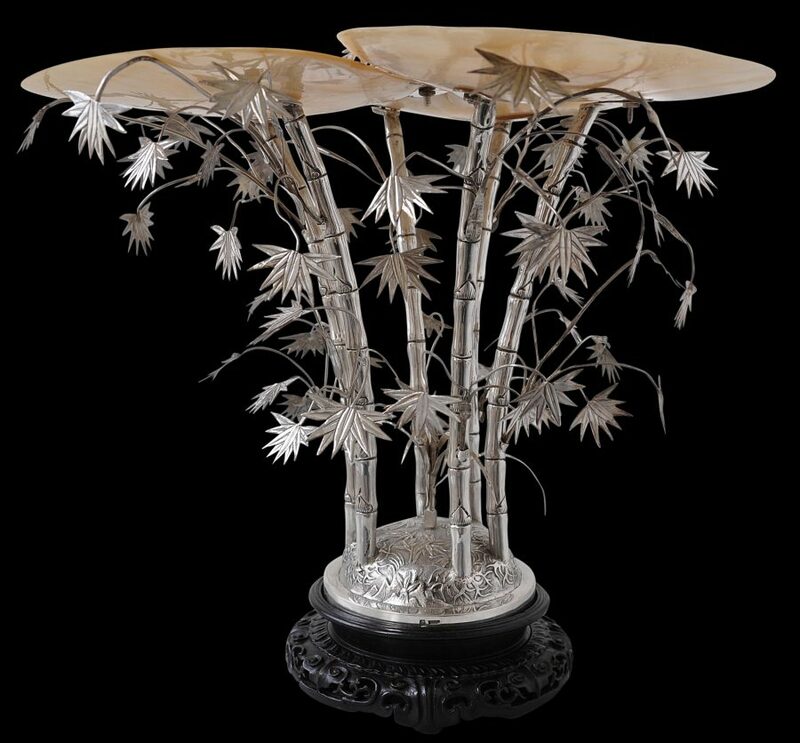 This impressive tazza or sweetmeats plate and stand comprises three large mother-of-pearl shells affixed to a thicket of bamboo comprises six bamboo canes and dozens of leaves, all in finely cast and engraved silver, and the original wooden stand carved from hongmu wood. The tazza is affixed to the wooden stand by means of a silver screw and nut, the top of which is disguised as a central, young bamboo shoot, naturalistically rendered. 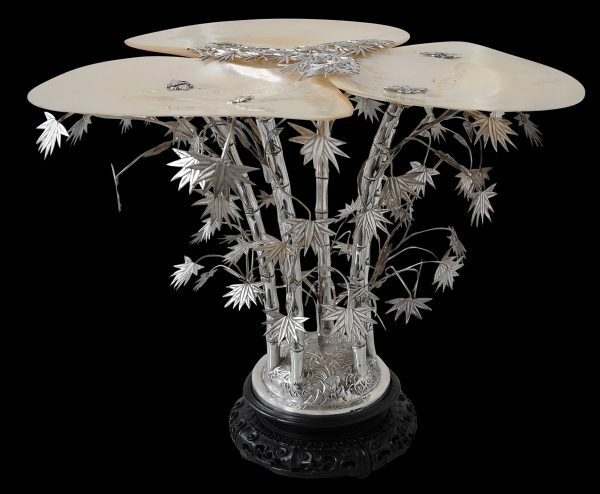 The shells are attached to the silver bamboo canes beneath by silver screws the tops of which have been disguised as silver butterflies in flight, each one being finely engraved. 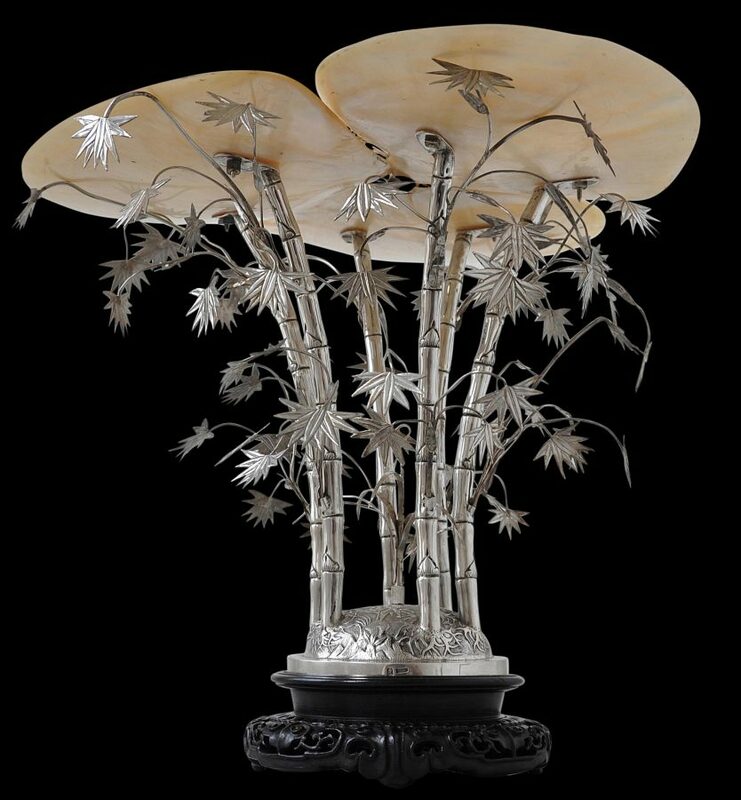 A central three-part flourish of silver bamboo leaves helps to keep the shells in place and to disguise the natural gaps between them. The bamboo leaves which sprout from the canes are all detachable and sit in small slots cut into the canes. The bamboo canes rise from a domed silver base that has been chased with other shrubs, rockery motifs and copious fibrous, shallow bamboo roots. The tazza is stamped to the side of the base with ‘WH90’ for the maker Wang Hing, and with an illegible Chinese ideogram. Wang Hing was a firm that was active in Canton and Hong Kong in the last quarter of the nineteenth century and first quarter of the twentieth century. 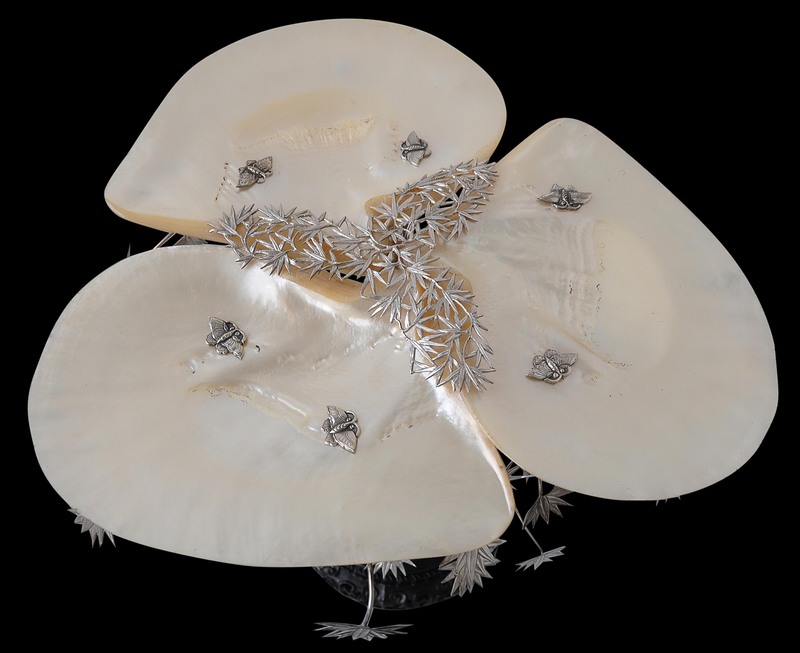 This magnificent piece is in excellent condition. Chan, D.P.L., Chinese Export Silver: The Chan Collection, published in conjunction with the Asian Civilisations Museum, Singapore, 2005. Forbes, H.A.C. et al, Chinese Export Silver 1785-1885, Museum of the American China Trade, 1975. Marlowe, A.J., Chinese Export Silver, John Sparks, 1990.